Kathryn Mueller, soprano, delights audiences in both concert and operatic performances. Praised for her “pure sound” and “flights of stratospheric brilliance” (Atlanta Journal Constitution, Miami Herald), she has appeared as a soloist with the Washington Bach Consort, Santa Fe Pro Musica, Firebird Orchestra, Tucson Symphony Orchestra, Atlanta’s New Trinity Baroque, Musica Sonora, and True Concord, and in operatic roles with Arizona Opera and the Seattle Academy of Baroque Opera. In 2009 she made her international debut during a musical Peace Tour across Indonesia with the Swara Sonora Trio, and just months later gave concerts in Central Mexico with the period orchestra Capella Guanajuatensis. An accomplished ensemble singer as well, Kathryn has sung with Seraphic Fire, the Handel and Haydn Society, the Oregon Bach Festival, and the Santa Fe Desert Chorale. 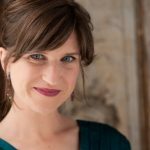 Kathryn has recorded extensively with New Trinity Baroque on the Edition Lilac label, and is also featured as a soloist on recordings by the Santa Fe Desert Chorale and Seraphic Fire. For four years she was a teaching artist for Opening Minds through the Arts, a student achievement and school improvement program that integrates the arts into the core curriculum. Kathryn holds degrees in music from Brown University and The University of Arizona. Upcoming performances include debuts with the New Mexico Symphony and Bach Collegium San Diego, repeat engagements with Santa Fe Pro Musica and Miami’s Seraphic Fire, and a featured concert on the Arizona Early Music Society series with her soprano duo Les Sirnes. For more information, visit www.kathrynmueller.com.